Join TLRP in support of this festival and the incredible musicians who will take to the stages. Visit us at our booth in the Marketplace. 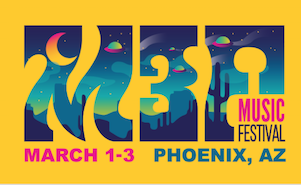 M3F (McDowell Mountain Music Festival) is a 100% nonprofit music festival that was established in 2004 and has become a musical destination for festivalgoers. The Festival has attracted visitors to Arizona with previous acts such as Flume, Beck, Kid Cudi, Chromeo, Father John Misty, Grouplove, The Avett Brothers, The Revivalists, DJ Mustard, The Roots, The Shins, Slightly Stoopid, and many others. In a commitment to giving back, M3F has adopted a 3 C’s belief – community, culture, and charity. These 3C’s fuel the Festival’s underlying dedication to its local people and causes. In the spirit of this belief, all of the proceeds from the Festival benefit local nonprofit organizations. M3F is a great opportunity to experience the energy of people joined by their love of music and art, and their enthusiasm in helping the community.